Providing a snug and comfortable fit, the Briers Purple Lady Gardener Gloves B5263 are ideal for protecting hands when working in the garden. The colourful purple gloves are ultra-soft while still being tough, and feature an adjustable Velcro strap for a secure and comfortable fit. The product code for the gloves is: B5263. 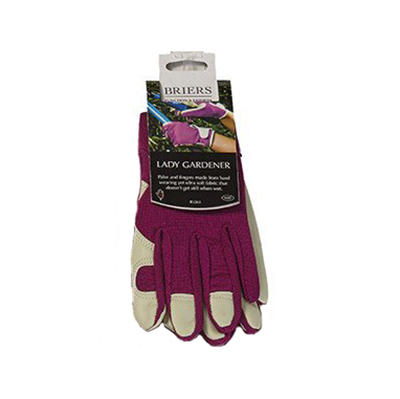 The Purple Lady Gardener Gloves combine comfort and durability for ongoing protection during gardening. They have an ultra-soft feel to keep hands feeling comfortable during lengthy sessions in the garden, while also being constructed from tough and durable fabric for reliable protection. The Briers Purple Lady Gardener Gloves B5263 are available in a single size that should be suitable for most users. Please consult the table below for details.